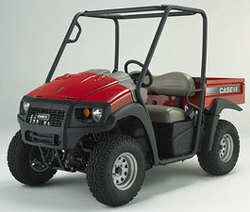 Case IH is introducing a new line of rugged, four-wheel drive utility vehicles. This compact Case IH Scout UTV has a 14 hp gas engine, can reach 25 mph and fits in the back of a pickup. Racine, WI (PRWEB) September 3, 2009 -- Check fields, haul feed, and go places a pickup can't get to, with a new Case IH Scout utility vehicle (UTV). This rugged line of four-wheel drive UTVs, sold exclusively through Case IH dealers, offers plenty of power, accessories to match any chore, and premium features at an affordable price. "And with a top end speed of 25 miles per hour, a new Case IH Scout will help you get more done in less time," says Shawn Boone, Case IH livestock marketing manager. "For growers who already run red, we invite you to work, play and explore with a new Case IH Scout," Boone adds. "Put one to the farm test. We're confident it'll be a small, speedy complement to the bigger Case IH equipment already in your shed." "We named them 'Scout' because that's what they help you do," Boone continues. "Scout your crops, scout your livestock, scout your hunting land. You can even equip a Case IH Scout with a Case IH AFS® receiver to mark your scouting notes on georeferenced field maps." A Case IH Scout is also ideal for hauling feed, seed, tools and landscaping material, "Whatever you need to move, where ever you need to move it to," Boone notes. "Crop and livestock farmers, contractors, landscapers - anyone who demands more from their equipment - will appreciate a new Case IH Scout." Boone says the name "Scout" has historical significance, and will be instantly recognizable to International Harvester collectors and fans. "The old International Scout was the world's first SUV, and many are still on the road today. The new Case IH Scout UTVs are worthy successors to the original Scout's legacy of power and dependability." "With the Case IH Scout you get a safe, comfortable ride in rough terrain, smooth shifting, fast stopping and fuel savings - and it all fits in the back of your pickup truck," Boone says. The two-passenger Case IH Scout offers premium features in a compact size, including: MacPherson Strut front suspension and best-in-class independent rear suspension; a wide ratio CVT transmission for fuel efficiency and smooth shifting; hydraulic, four-wheel disk brakes; ROPS protection, retractable safety belts and Halogen headlamps. For all the comfort, safety and fuel-saving features in a bigger box, there's the larger Case IH Scout XL. These also feature a wide ratio CVT transmission; hydraulic, four-wheel disk brakes; ROPS, retractable safety belts and headlamps; along with a double A-arm front suspension with coil overshocks for a comfortable ride; and a full-sized bed box with 800 lbs. (15.1 cu. ft.) of capacity - or 1,050 lbs. with the optional high capacity kit. A full range of Case IH Scout accessories is available, including: windshield, winch, front blade, bed dump, bed liner, camouflage, gun rack, brush guard, backup alarm and premium lighting such as fog lamps and turn signals. "Your Case IH dealer can customize a Case IH Scout to meet the unique demands of your farm, jobsite, hunting or recreational land - or all of the above," says Boone. Case IH Scout UTVs will be available from Case IH dealers in 2010.